Alternatively, clone the repo and add library as a module to your project. CircularFloatingActionMenu can be attached to any view in your layout. A Floating Action Button implementation is available in the library, with a similar look to new Material Design's FAB. Animations, start angle, end angle and radius are customizable via FloatingActionMenu.Builder. FloatingActionMenu is the essential class for the menu. Other two classes, FloatingActionButton and SubActionButton are just views and they can be replaced with any other view. You are completely free to create your own menu button and item views. 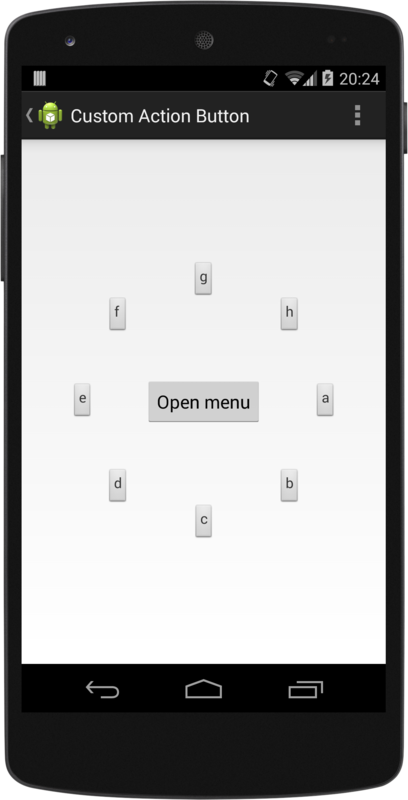 FloatingActionButton can be placed to one of 8 predefined positions on the screen. To place it somewhere else, extend it! You can write your own animation handler class by extending from MenuAnimationHandler to completely customize menu opening and closing animations. Then all you need is to create an instance of your custom animation handler and pass it to FloatingActionMenu.Builder via setAnimationHandler( ) method. See CustomAnimationHandler in samples module for a sample animation handler. CircularFloatingActionMenu is released under MIT Licence. See file LICENCE.